March's gaudy and remarkable box office bonanza will to some extent be repeated in April, with at least one enormous franchise movie. But first: a brief interlude. Smurfs: The Lost Village is the highest profile new movie of this week, which is a depressing sentence to write under any circumstance. A full on reboot of the live-action/animation blend of the two Smurfs movies from earlier this decade, this version goes entirely animated for a story about everyone's favorite Belgian blue elf/troll/whatever funny-hatted creatures (Take that, the Snorks!). A stripped down version of the gigantic Smurf family sends a handful of the more recognizable Smurfs (Brainy, Clumsy, Hefty and naturally Smurfette) on a journey to follow a mysterious map that may hold secrets about the origins of the Smurfs (hint: see subtitle). While there's obviously no live action talent to draw on, the voice cast does include some recognizable names and a few people who, while they aren't big stars, are actually decently talented and funny. Katy Perry is ditched as Smurfette for another pop star (Demi Lovato), while Jack McBrayer, Danny Pudi, Mandy Patinkin and Rainn Wilson represent the voices of the characters that are being acknowledged openly. Then there's the cast that's not really featured strongly – with Michelle Rodriguez, Ellie Kemper, Ariel Winter, Meghan Trainor and ... Julia Roberts?!? 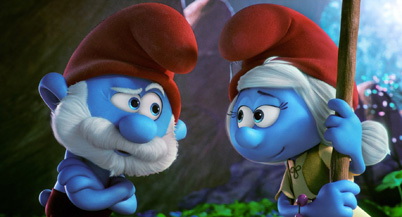 as characters with some variation of “Smurf” in their name, which gives a larger hint as to what long standing question about Smurf sociology this movie's going to tackle. However, it looks much more like an action-adventure family film, albeit one with small ambitions and lots of screaming from its characters. Somehow, this seems to pale in comparison to last fall's Trolls, especially when that film had Justin Timberlake songs to fall back on. It's also a franchise that's in a bit of a struggle – while 2011's version managed to fool some people into a $140 million domestic take, the second version just two years later earned half that, which is why we're getting this different, cheaper version. Then again, judging by the success of Boss Baby, people will buy just about anything in kids' entertainment. Still, with terrible reviews and a damaged brand, this should manage only about $19 million this weekend.